We’re guessing your students showed some serious motivation during Hour of Code—and loved the encouragement they received. Let’s keep them riding that wave! To print Hour of Code certificates for your students, just select the “Gradebook” tab, go to “Hour of Code”, and click the “Print All Certificates” button. Show them your classroom’s lines of code – and set future goals. To view lines of code, just go to your teacher dashboard! Share your classroom’s showcase with parents in an email or newsletter! Learn how to share your classroom’s showcase! Pick an activity and project it onto the board as this teacher did. Visual and aural learners benefit from seeing and walking through it, and electing a verbal learner to go up and explain it could help everyone. Logical learners will love hearing the code laid out and explained, and everyone will enjoy trying it out themselves. Take the activity to the iPads! Physical learners will love the tactile element of coding on iPads, and social learners thrive with group coding projects (try assigning a group of interested students to create a multiplayer game!) Solitary learners may prefer to take an assigned activity to a comfy chair and complete it on their own (here’s how to assign an assignment to a student from your teacher account). Mix it up during STEM time! Use offline time to teach computational thinking, a skill that guides kids through all walks of life. Introduce activities that encourage algorithmic thinking, like having students guide each other through an obstacle course! Tynker Tip: Print Tynker code blocks to use in your classroom for everyday activities! Explore coding from all angles—bring it into your social studies or math curriculum to provide an exciting, interactive experience that deepens learning of both the subject at hand, and, of course, coding! Any one of our 200+ STEM activities can be worked into your lesson plans. Kids can learn about the planets with Solar System or deepen their understanding of the ecosystem with Ecological Pyramid. 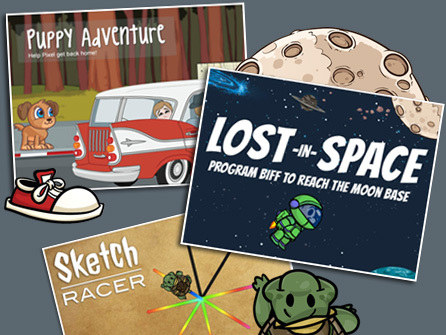 When it comes to integrating coding with other subjects, the possibilities are endless! We’ve seen teachers use Tynker to create flashcards, tell stories, and even map the tributaries of a river. Capture your class’s attention by making peer learning interactive and multifaceted. They’ll explore each other’s solutions, and get a chance to watch each other’s thought processes and results laid out on the screen. This teacher encourages her students to teach one another through code! A huge part of coding is problem-solving, and every person approaches problems differently. Peer learning combines the benefits of collaboration with technical learning! When kids team up, they end up with more ideas to sift through and an opportunity to develop life skills like collaboration. During Hour of Code, we saw lots of students working together to solve our activities, like this cute classroom! Thank you to @MsD_iIntegrate and @AllSaintsVALib for sharing the above photos of your students enjoying Tynker! 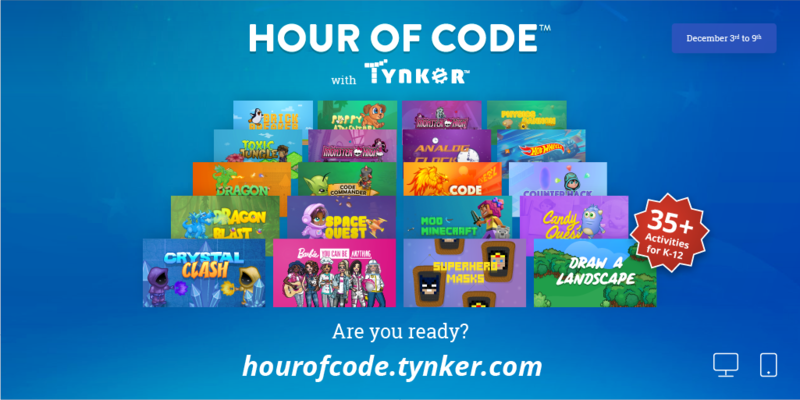 Tynker’s Hour of Code is now available!